Nino Dvalidse, right, is Vice Rector of Ilia State University. She has participated in the NUCLEUS RRI field trips focused on Civil Society (shown here) and Economy. In November, her institution will host an Embedded Nuclei. NUCLEUS is developing an RRI Roadmap for academic environments, but how will it work in practice? In November 2017, ten universities and research institutes will establish dedicated units to put it into action. These units, called “Embedded Nuclei”, will embed RRI implementation recommendations into their organisations’ cultures and policies. 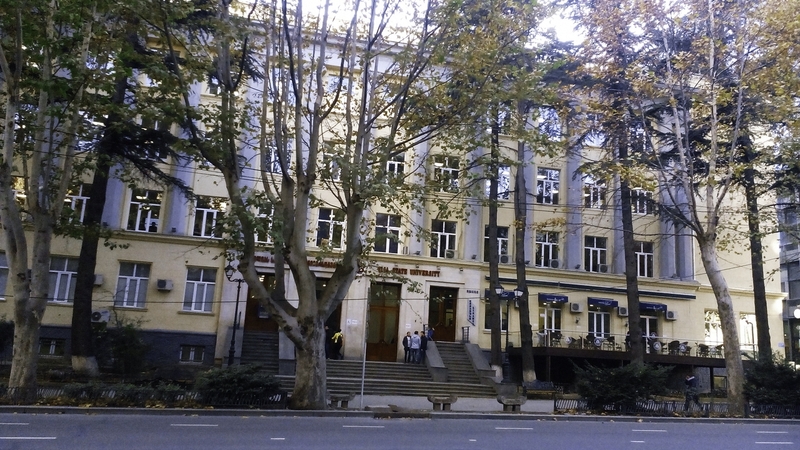 One of these Nuclei will be hosted in Tbilisi, Georgia by Ilia State University, home to nearly 30 research institutes and 800 professors and researchers on staff. The university’s Vice Rector Nino Dvalidze has been closely involved with NUCLEUS from the beginning of the project. Below, she shares her thoughts on Ilia’s motivation for hosting a Nucleus, how the project partners work together, and how she thinks her university can begin its culture change. Let’s start with Ilia. How did you become interested in the project and hosting a Nucleus unit? Ilia University is pretty big for Georgia, and we really try to be number one in the country for research citations. Two to three years ago, we started trying different things, like a national science engagement design event and science cafes. They worked pretty well, but we didn’t have any single unit at the university that was in charge of communication. So, we decided to jump on the project right away. The Nuclei hosts and their mentors met in Bochum, Germany in November. What did you discuss? The good thing is that our team – all of us – we’re already very comfortable with each other and that really helps because we can discuss everything very openly. Trying to, you know, find common ground, but also all the challenges and barriers specific for each institution. We agreed that there will be some common context for all, because there should be something common, right? The Nuclei would be the same and they would be a little bit different for every country. We still need to get information from the research that is ongoing, and that should be in June or July, I think. That will definitely influence a lot what we’re going to try to create. And we’re going to have more working group meetings…one in Georgia in June, yay! Dublin City University will be your mentor. And we’re so happy about that! So, what does that mean at this stage of the project for you? We have to have our own ideas of what we need, and then they will guide us, with someone from the outside looking at our structure and the relevant units at the university. The good thing is that we can learn a lot from the more experienced partners, but we can also adjust everything to our needs. You’re not copying anything just because it works in Ireland or Scotland! What do you think you might need to adjust to your needs? Our older generation researchers are stubborn! It’s rather easier to work with the younger generation and make them understand that this is a very natural process that any researcher should have in mind. So in our case, we think that we really need to focus on younger generations. We might, in terms of the structure, put it under the graduate school. Other universities in our group have the idea to put the Nucleus unit under the communications department or under the vice-chancellor for communications…but in our case I think it’s better to be under the graduate school. Of course, that’s not final. This is what we’re discussing with our mentor. Based on what you’ve seen this year through field trips and conversations with other partners, what have you learned about RRI since starting on the project? Basically, more responsibility in the research production and innovation production should be there from the very beginning, you know, when identifying what are the research topics. Universities are not separate from society; they are one of the actors, and should play a relevant role. In November 2017, Ilia and nine other Embedded Nuclei will bring RRI to life! Follow NUCLEUS on Facebook and Twitter to learn along with us.